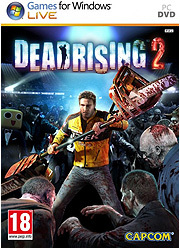 Review: Of all the zombie apocalypse games out there, Dead Rising is one of my favorite. We've all thought about what we'd do in a zombie outbreak, and DR gave you the chance to fight off legions of Night of the Living Dead-style zombies using guns and knives, but also more unusual objects like shower heads, trash cans, guitars, pretty much anything that could conceivably harm a person. When a sequel was announced, I was elated. It's several years after the mall in the original game was overrun, and people have more or less grown accustomed to the occasional zombie outbreak. In fact, your DR2 character, Chuck Green, regularly competes in a game show that centers on killing zombies. He's not crazy about this line of work, but he needs the money so he can buy his daughter Zombrex, an anti-zombification drug. Well, wouldn't you know it, keeping lots of zombies in a heavily-populated area turns out to be a bad idea. The zombies escape, Chuck is blamed, and the countdown to prove his innocence before the military rolls in begins. As with the original, the story is the weakest link in the whole project. A conspiracy theory emerges wherein the public is certain that Chuck is behind the outbreak because of black and white security camera footage showing a masked man planting a bomb. Plot twists involving characters being secretly evil can be spotted a mile away, to the point that you'll be yelling at your monitor, "Him! That guy! He's evil! Somebody keep an eye on that guy!!!" The characters themselves are all a little off as well, thanks to Capcom's bizarre take on western culture. One of your major contacts is a woman who runs CURE, an organization that is more or less PETA for zombies. For some reason, this group is shown in a sympathetic light, to the point that Chuck expresses his own reservations about killing zombies, right before he yanks a swordfish off the wall and starts impaling them for fun. Furthermore, the game places looters in your path and declares them enemies, all while your own brand of looting goes unnoticed. As a whole, normal characters act in such a way that you'll swear they're among the ranks of the psychopaths you'll have battle amidst your own hypocritical looting. That's one thing that has returned from the original game: the hideously-unbalanced psychopath battles. Every now and then, you'll run across certain individuals for whom the outbreak has proven a bit too stressful. The result is that they have not only gone crazy, but have also cultivated superhuman levels of strength and endurance. Going toe-to-toe with these characters is tricky to say the least. There appears to be some pattern of beating them until they shrug off your attacks and flatten you with a counterattack, but for the most part, you'll be using the same strategy for all of them: attack relentlessly, stop to eat food, repeat. Don't get me wrong; the basic gameplay elements have seen some improvement. The most notable addition is the combo system, which lets you combine two items to make one ridiculous (but effective) item. Combinations ranges from obvious (nails plus bat equals nailbat) to the less obvious (fireworks plus pipe equals rocket gatling gun?). The different combinations are fun to figure out, but it's disappointing that each combination is so rigid and specific. For example, you can combine a pair of boxing gloves with a bowie knife to make a devastating claw weapon, but can't substitute a chef's knife for the bowie knife. It's a small gripe, but some of the distinctions do seem a little arbitrary. The one change I am most grateful for, however, is the improved survivor AI. Before, rescuing a stranded person meant constant hand-holding (sometimes literally) or else they would get lost or killed instantly by zombies. Now, survivors actually seem to possess the will to live, and will fight off zombies and follow you fairly well, even better if you give them a nice weapon to wield. And speaking of other people, DR2 also boasts a multiplayer co-op option. Now you can have a friend drop in to help you with a particularly challenging section, or just to provide a distraction for the psychopaths. I did have some trouble jumping into random games, but that seemed to be the result of other players not being open to the idea of a stranger helping them out. I should know; I was one of them. In addition to coop, players can also engage in Terror Is Reality, a multiplayer game based off the pay-per-view zombie killing show in the single player campaign. Therein, players compete in three different events for the chance to win cash that can be used in the single player campaign to buy any number of vastly overpriced items for sale at the looter-run pawn shops. It's not a particularly rewarding minigame in any sense of the word, and I was only able to join two games in the dozen or so attempts I made. If you want to earn money, you'd be better off cracking open ATMs and hammering slot machines than waiting for three other people to join you in a game of TIR. I would summarize all of this by saying that DR2 is a lot like the original DR. If you didn't like DR because saving people was a hassle, you're in luck. If you didn't care for the original because mass zombie slaughter via power tools doesn't interest you, well, DR2 isn't really going to change your mind. The improvements that were made were badly needed, but there is still room for further improvement. Love me some DR2. Only have played it on the 360 though. Love the outrageous costumes too. I ended up unintentionally in DR Gonzo garb for a majority of the game. Weapon of choice is the plate launcher for zombies, lightsaber for psychos. When I have the disposable income for it, this is on the list of games I intend to buy and it is pretty close to the front of said list. Sorry Boogie, but dead Rising 2 is NOT a 4 pickle game. Not by even fans of the game's standards. It's a 2.5-3 pickle if that. The game still has the same frustrating flaws the first game had and very little has been fixed. Major flaws that make the game basically unplayable. 1. The timer system. It's just dumb. Sure it might make things more realistic, but all it really does is make you play the same game several times. When you are finally ready to just mess around, the timer fouls up your fun yet again as you never have a free-roaming as an option... you'll be interrupted when the time runs out. 2. Broken map. The mall can be confusing to navigate and you can't set point markers everywhere, just on indiviual missions. What's unacceptable though is that once you rescuse a survivor, the arrow doesn't point towards the safe house. So you have to hope that there is a safe house based mission for that day or that you remember the way. 3. Unfair and unnecessarily hard boss fights. All bosses are humans without any special powers, body armor, ect. I can kill a zombie, who's a frikkin undead super human, with two shotgun blasts. I can't kill a human boss with 4 rounds of fire from a machine gun! Hell without giving too much away there's one boss who can jump over bathroom stalls with a single bound! If you want the boss fights to be hard make the bosses smart, NOT indestructable and super-human. 4. Boring gameplay. There are maybe 4 types of zombies in the game. They all can be killed and attack your roughly the same way. In turn there are only 4 or 5 different death animations for each zombie. So no matter how cool mounting chainsaw to a motorcycle sounds, it gets real old killing zombies. Also they are more of a living obstacle in the game as well, with the REAL gameplay involving fetch missions (people or stuff) or boss fights. The story is pretty good. It's obvious what is going to happen about 30 minutes in but it's still good enough that you'll want to finish it once. Of course to finish the game you have to play the damn thing over and over to build yourself up enough so like DR1, few people will ever get that far. I'll be honest, I beat it with a trainer... no way I was going to put myself though that torture. I didn't get into the first DR and was very wishy washy on this one. I was excited when I heard Blue Castle Games was developing it but was very disappointed when they canceled another game they were making (The BIGS 3) that I was REALLY looking forward to in order to make this game.